The Gen Project Finance helps in integrating and controlling all your important information by the automation of process for faster and accurate reporting. Our Personal financial management software replaces all the manual, error-prone, spreadsheet- based processes with automation, full control and visibility. The finance management software helps in financial planning and producing all the required reports for financial assistance given by the bank authorities. Hence, Gen Project Finance solves all your problems regarding CMA requirements, within the scant time without any error. >Sales Realization(Domestic/Export): The conversion of goods, services and assets into cash, provided to the clients also be performed by Gen Project Finance. The user easily calculates Sales Realization by the given three methods in the software- Product basis, Year basis and Percentage basis. >Other Operating income: he report of the operating income is easily obtained by the user. Miscellaneous income: The Gen Finance avails the user to view and create reports of the operating income in three different basis of Product, Year and the Percentage. >Miscellaneous income: The user can generate the report of the income of various types and from different sources. The only thing to do is to select the sources and the basis of income, which user wants to include in the report. >Export Benefit income: The income in the form of benefit from the exported product of the company can be reported in the prescribed format. The financial reports allows the user to use this software as a money control system. The reports related to the management of the large amount of money by the company comes under this category. The user can generate and view reports from the given options of Generate Reports and View Reports. 5. Project Theory:This option gives the final report of the project which contains project details, indexing of all the used reports, etc. The User can take this final report in the word format. Options: It gives the facility of selecting multiple reports from the list, while printing the reports. The other features like backup, restore, log file, import client, etc. are also present in the Gen Finance software. 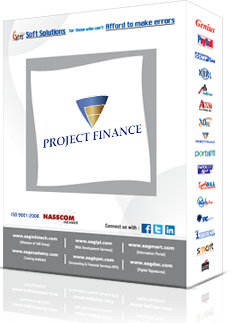 > Import of data from Project Finance and from Genius: The Gen Project Finance Software enables user to import actual and projected data on the Balance Sheet and the Revenue Statement of the Genius and Project Finance here in the CMA section of the software. > The Percentage Basis and Ratio Basis are the available methods to estimate the projected years, if CMA is not linked to the Project Finance. > The Facility of importing data from Project Finance on the basis of user's requirement is given in the software. As, user can import data of all projected year, all existing year, all year and of any particular year. > Other Details- It avails the preparation of sheets regarding bank details like the name of the Bank, Nature of Facility, Exiting Limits, Limits utilized during 12 months, outstanding amount and the requested limit. User can save and delete multiple banks as per the requirements. > All the Project Reports and CMA Reports are exported in excel and word. > It also allows the user to generate the reports for maximum 5 years of actual and 10 years of projected duration. > Project Report is generated for existing and proposed project.